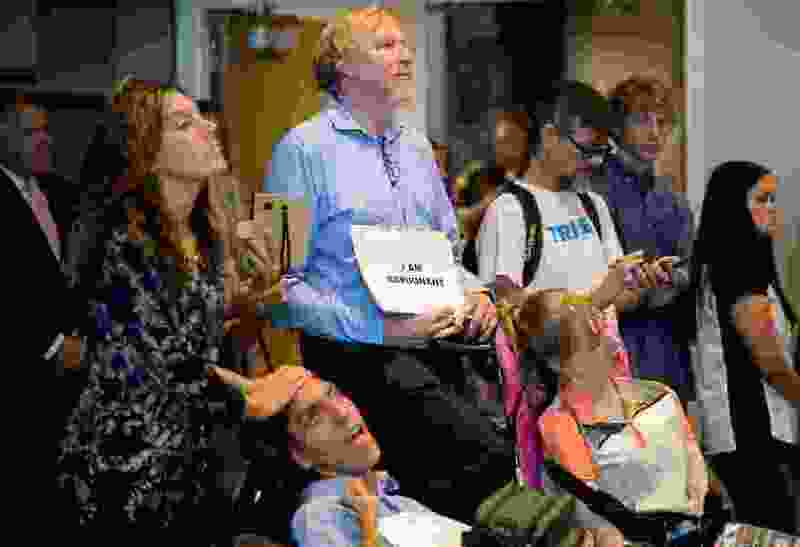 (Trent Nelson | Tribune file photo) Protestors at a news conference where a coalition including the LDS Church came out against Utah's medical marijuana initiative, in Salt Lake City on Thursday Aug. 23, 2018. Utah Gov. Gary Herbert still plans to vote “no” on Proposition 2, which would legalize medical marijuana in the state. But he said Thursday that whether the ballot initiative passes or fails, Utah’s lawmakers need to work to make medical cannabis available to patients. “If it doesn’t pass, then we need to get with the Legislature and come back into session and create a better law,” Herbert said. “If it does pass, we still have the same challenge, and that’s working with the Legislature and all the stakeholders." He said the initiative’s proposed law is flawed, and would require cleanup work if approved by voters in November. But he added that he understands the frustration of patients who feel the state has moved too slowly to respond to the legitimate medical needs of residents. The governor’s comments came during his monthly televised news conference on KUED Channel 7. Herbert became animated discussing the issue of medical marijuana, criticizing Washington, D.C., for ignoring the debate for years while states moved forward in violation of federal law. More than 30 states have now legalized medical marijuana. The Governor's Monthly News Conference on KUED, a live, unedited exchange between reporters and Governor Gary Herbert. It’s a sad commentary on the country, Herbert said, that members of Congress have “sat on their hindquarters” while marijuana remained a Schedule 1 drug, largely restricted from medical research and clinical trials. Among the potential amendments Herbert said he’d like to see if Proposition 2 succeeds is a restriction on the distribution process. The initiative calls for privately owned medical marijuana dispensaries, but Herbert said he’d prefer to see patients obtain their cannabis products through a state-run system. DJ Schanz, director of the Utah Patients Coaltion, said there’s a reason that most states with medical marijuana rely on dispensaries for distribution. There would be major legal ramifications, he said, in operating a system like Herbert suggested. Schanz said the willingness of elected leaders like Herbert to consider and call for marijuana legislation shows the progress that’s been made on the issue in the last two years. The subject was dismissed in the past, Schanz said, where opponents of Proposition 2 are now talking about the minutiae of the initiative’s Utah Medical Cannabis Act. Asked about the likelihood of legislative amendments if the initiative passes, Schanz said the Legislature has the right to adjust the law, and that it was “a worry from the beginning” that alterations would be made. During his news conference, Herbert also touched on his future political plans. He has announced that he will not seek re-election in 2020 but has continued fundraising efforts, including an upcoming $650-per-plate gala featuring the Utah Symphony. Some sponsorships are offered for donations of up to $25,000. Herbert said he’d “never say never” to running again. But his current fundraising efforts are intended to support the Utah Republican Party, Herbert said, or potentially a candidate running to succeed him as governor. “There’s a lot of different causes out there and candidates I’d like to support,” he said.